Bostonian Margaret Blood finds that the way to a child’s graduation is through his stomach. Funny thing about Margaret Blood. 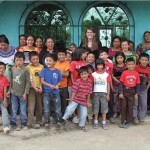 She fits no profile of North American do-gooders who come to Guatemala. She hails not from the Bible Belt. Nor is she a hippie-esque proletarian or a homeschooling missionary mom. But a mission she has, a mission of such scope that some of her friends thought it could never be realized. But she may prove them wrong. Blood, who speaks the King’s Spanish, is a Harvard graduate. She is single and childless, unless you count the hundreds—and soon thousands —of Sololá children who may someday carry her picture in their wallets. They may recall her as the vivacious blond gringa whose campaigns filled their tummies each morning and noon, and filled the hours in between the eating with learning. Much of her story is familiar. 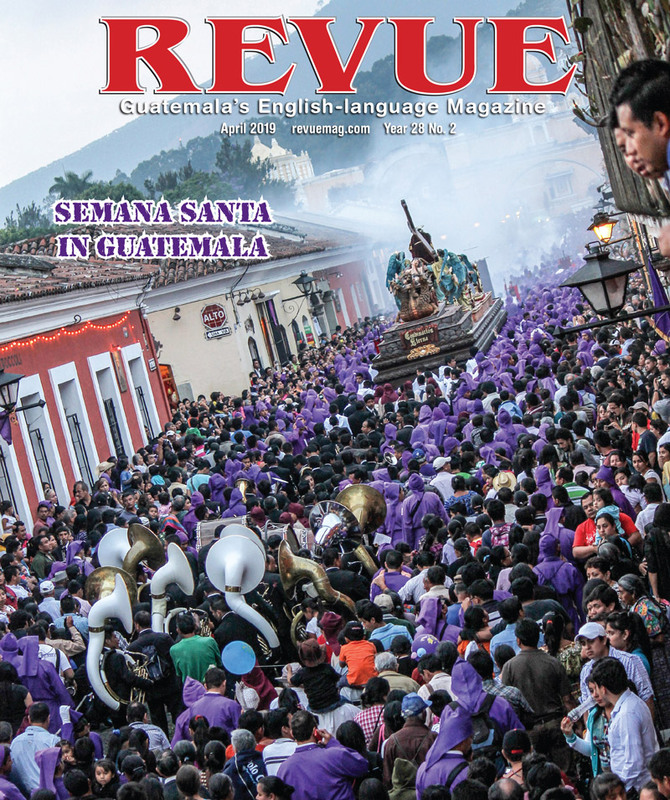 She caught “Guatemala Fever” as a casual tourist and utterly succumbed upon spying Lake Atitlán for the first time. What happened next is likewise familiar: She went stateside and daydreamt of returning to the Land of Eternal Spring. But the most compelling pull factor was not Atitlán, but the children. Like any visitor to the basin in 2003, Blood encountered needy children and wondered why they were not in school. Part of the answer, she would learn, is that many of those kids were in school, but they attended either in the morning or in the afternoon. But what about the kids who were never in school? She resolved to make her next visit to Guatemala a longer one. She would get some answers, and vet some solutions. No one was more qualified to do so. Blood had established after-school programs in inner-city Boston and a summer day camp for cultural awareness and the arts. She worked 10 years with the Massachusetts Legislature, eventually founding the Legislative Children’s Caucus. Later on, she birthed the Strategies for Children office, which led to universal access to high-quality early childhood education in the state. Blood then went on to address substandard reading levels among Bay State kids and secured state-funded scholarships for early educators. 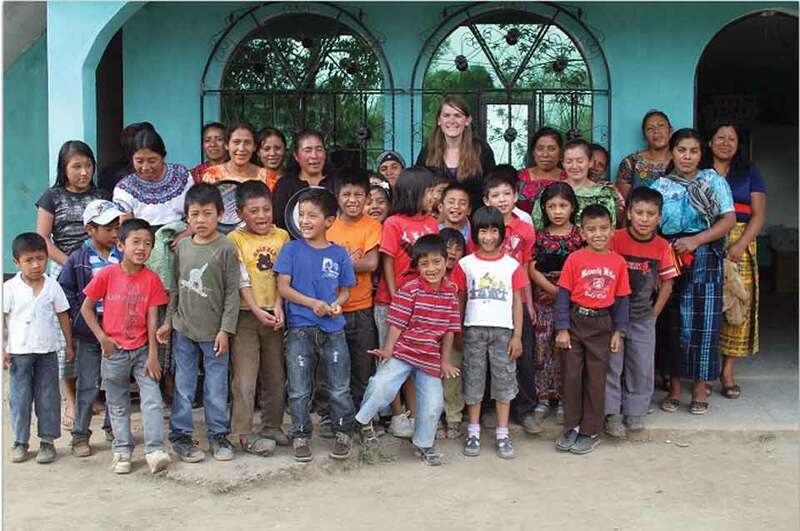 Given this background, her first instinct on returning to Guatemala was to help teachers. But she soon learned that this intention, though noble, was misplaced. The main issue was not class size, broken ditto machines, or the lack of tetherball courts. The solution, as Blood saw it, was for schools to serve food. 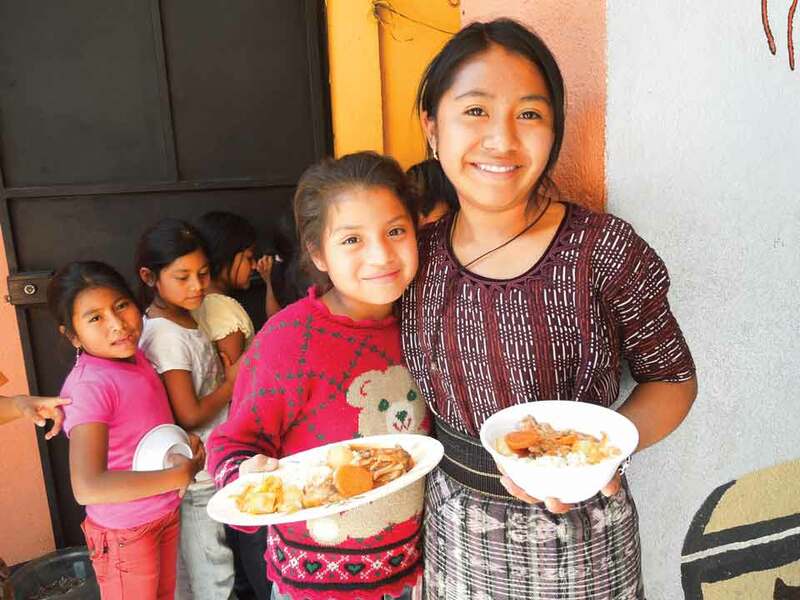 “I was told,” she says, “that some kids were practically starving.” She cites a USAID study that found that only 40 percent of Guatemalan children finish sixth grade, and other reports that in some areas eight of ten children are chronically malnourished. By 2008, Blood had raised enough funds to create a non-profit entity, Mil Milagros, and to pioneer her ideas in two community schools (Proyecto Semilla in Panajachel and Pacamán in San Andres). Her Guatemalan commitment quickly snowballed, and within a few years she had to resign as president of her Boston NGO in order to run Mil Milagros. Mil means a “thousand” but its appearance in the organizational handle takes specific inspiration from the United Nations’ “Millennium Development Goals,” which include a double-pronged offensive to eradicate hunger and ensure completion of primary education. 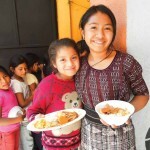 “In order to realize our goals,” Blood says, “we felt it necessary to align our work with a broader movement.” The rest of the name, Milagros, means miracles; Blood, a lifelong Protestant, is counting on divine assistance. Mil Milagros offers tax exemptions for its donors, the first of whom were drawn from Blood’s own circles in Greater Boston. 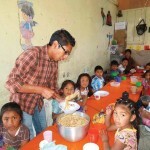 The pilot projects in Panjachel and Pacamán worked by involving students’ families. School kitchens were upgraded, with mothers and grandmothers recruited as volunteer cooks. Fathers were brought in to plumb the bathrooms with running water and do other handiwork. The kids bring their own dishes and silverware, along with quotas of firewood for the school stoves. She has seen basic hygiene become a habit, too. “Where I grew up, hand washing was inculcated early on. 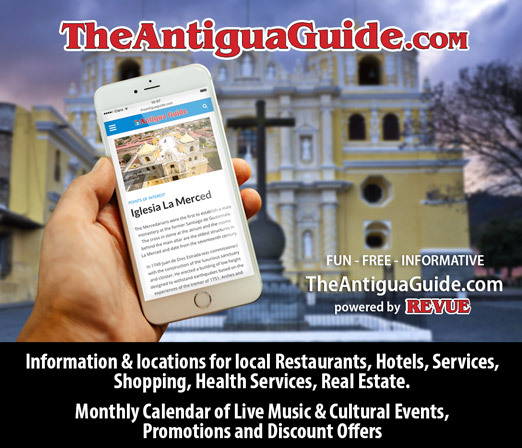 And we did not have to use leaves instead of toilet paper.” Blood has noted that in the time Mil Milagros has operated, children whom they knew as kindergartners are today junior “lobbyists.” These fifth- and sixth-graders ask their parents to keep toilet paper in their homes. And they petition their mayors for things needed by their schools. Blood estimates that $1 per child per school day is enough to cover meals, a textbook, some school materials and hygiene supplies. Mil Milagros maintains a database for each of its partner schools to track children’s height and weight, school attendance and hygienic interventions. In 2011, 95 percent of the children supported by Mil Milagros were graduated from sixth grade. For 2012, this increased to 98 percent. Almost all of these laureates want to go on to básico (middle school). “Malnutrition has irreversible consequences by age 3,” Blood notes. To preclude this, Mil Milagros and a sister NGO (Wuqu’ Kawoq) organized mothers in all of the partner communities and put 200 babies and small tykes on vitamin regimens. Each month the mothers attend workshops on nutrition and women’s health. They weigh and measure the babies quarterly, and arrange medical follow up for those who need it. 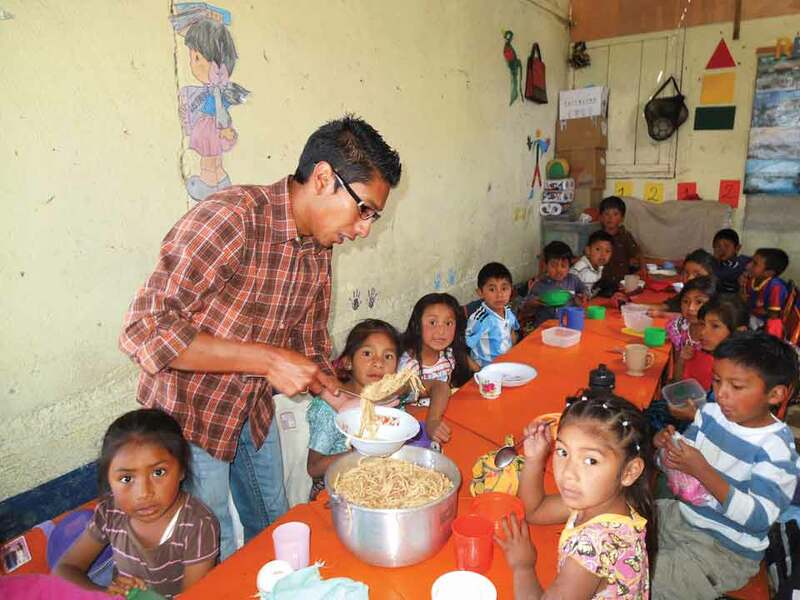 Mil Milagros now operates in six communities in Sololá Department. It serves over 1,000 children with the help of 400 family women and 42 teachers. Blood’s goal is to increase this a hundred-fold. Her in-country director, former Peace Corps volunteer Carolyn Daly, from upstate New York, thinks it will happen. Excellent article and program, but I think we could find a better word that “war” when it comes to helping feed children. We have enough real war in our lives already. Keep up the good work!